For the 7th year in the row, Apple is the most valuable brand in the world according to Interbrand. Apple who became the 1st US company in history evaluated at $1 trillion 2 months ago, had an increase of +16% from last year and has now a brand evaluation of $214,480 million. It’s also the first time when a brand has an evaluation of more than $200,000 million (last year Apple evaluation as a brand was $184,154 million). Compare to the most valuable brands in the world 2017, just one brand drop from the Top 10: IBM from no. 9 – 2017 to no. 12 in 2018 and one brand that was outside the top 10 just entered this year: McDonald’s from no. 12 in 2017 to no. 10 in 2018. In rest, we have the same brands on the top 10 positions as last year with a small position movement from some of them, as you can see below. 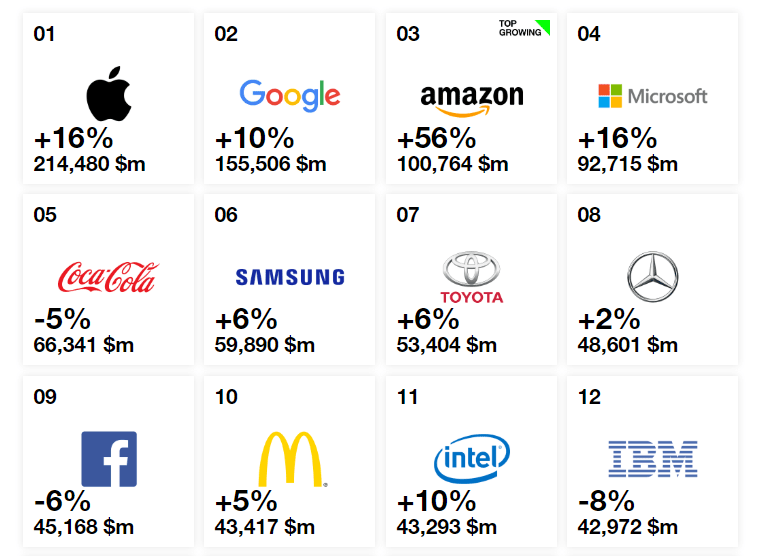 In this Top 10 most valuable brands in 2018, only 2 brands have a decreased of their brand value compared to last year: Coca-Cola (-5%) and Facebook (-6%) but Amazon with an incredible increase of +56% compared to 2017 is the 3rd most valuable brand in 2018. 9. Facebook – $45,168 Million (-6%). Which of these brands are you using on a daily basis and who is your no. 1 brand? See also: How To Avoid Brand’s Negative Publicity On Internet?